race report | Move fast. Think slow. Fact 3: Walking down stairs or doing much at all is particularly painful the day after a pavement pounding race! The Final 50 metres of Ouch – thanks Mark Wild for the Pic! Despite all of the above, I still toed the line here at home in Calgary for the annual Policeman’s Half Marathon with about 1300 others yesterday morning at 8:00am just as the kids were getting up and having pancakes with the babysitter. I have done this race two or three times in the past and the weather has never been great. Last time I competed in this race it was a full on snow storm! Yesterday, it was maybe 4 degrees C at the most when we started with a rather chilly wind kicking up. I was started to regret my choice to wear shorts as we lined up. I thought I might try to stick with my coach, Cal off the start but he took off like a bat out of hell and later told me he went through the first mile in 5:35! Good choice by me! Although I did see him up ahead several times during the race I could never quite close. 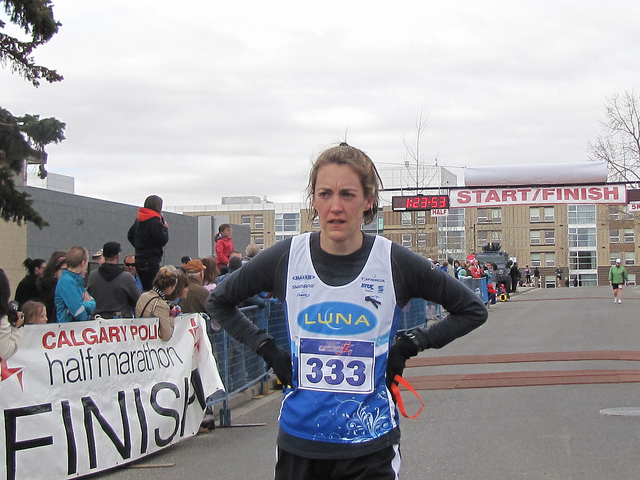 A few miles into the race, there were a few other women still around me but soon it felt like no (wo)man’s land. I bridged up to a guy in a bright green shirt and decided to stick to him and hopefully get some draft into the headwind sections. He was running super relaxed and thanking every group of volunteers we passed. Wish I had the breath to do so as well! 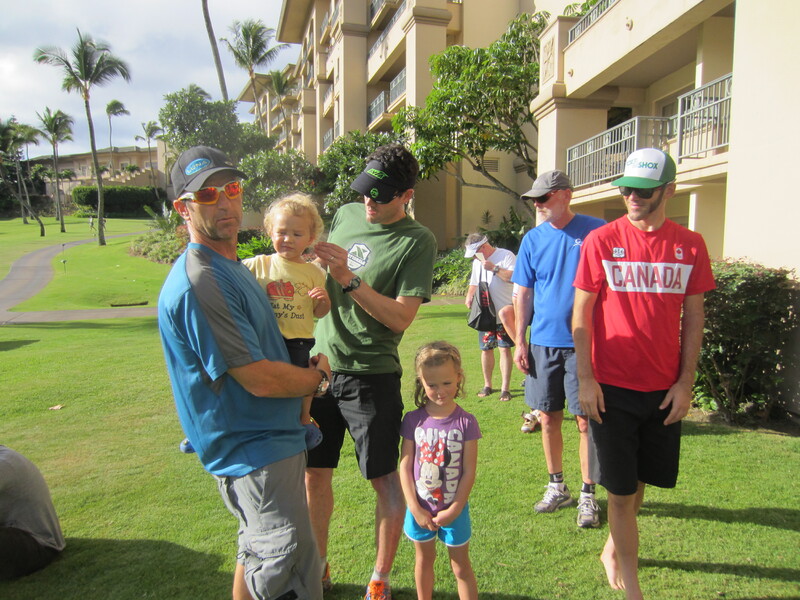 Turns out bright green shirt guy was named Mark St Amant about to set a PB by 12 minutes!!! Awesome! Despite doing a short warm up before the race, my legs felt much less like ice-cold bricks and I finally did start to feel warmer overall by about the 8km mark. The sun sort of came out for a bit as we ran on the bike paths around the south side of the Glenmore Reservoir. 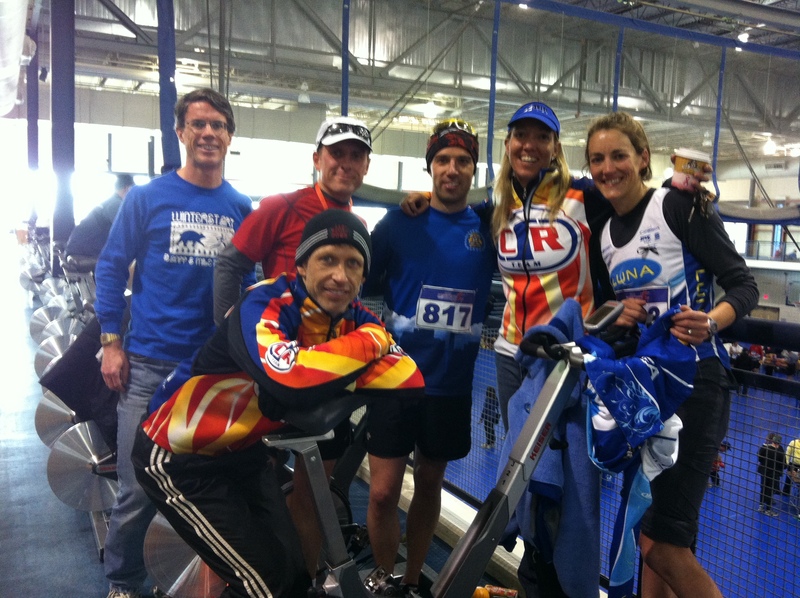 It was awesome seeing all my CSR training buddies not racing out on course cheering too. At the 12-13km mark I finally decided to try taking a gel during a running race and not gag. To my surprise my Clif Chocolate Cherry Gel (new flavour this year!) with caffeine went down pretty well and hopefully gave me a bit of a boost to get through the finish line at the 1:23:38 mark for 11th overall and 1st female – a PB on this course for me and a good test to give myself a bench mark before my next half marathon run race one month from now! Why did I just do this again? Congrats to everyone who came out and all my CSR training buddies who set PBs as well! Grabbing the kids for some pancake brunch after rocks too! Winning a few free pairs of shoes from Foranzi’s Tech Shop was pretty sweet too! Of course us Tri-geeks have to get a post race spin in too! 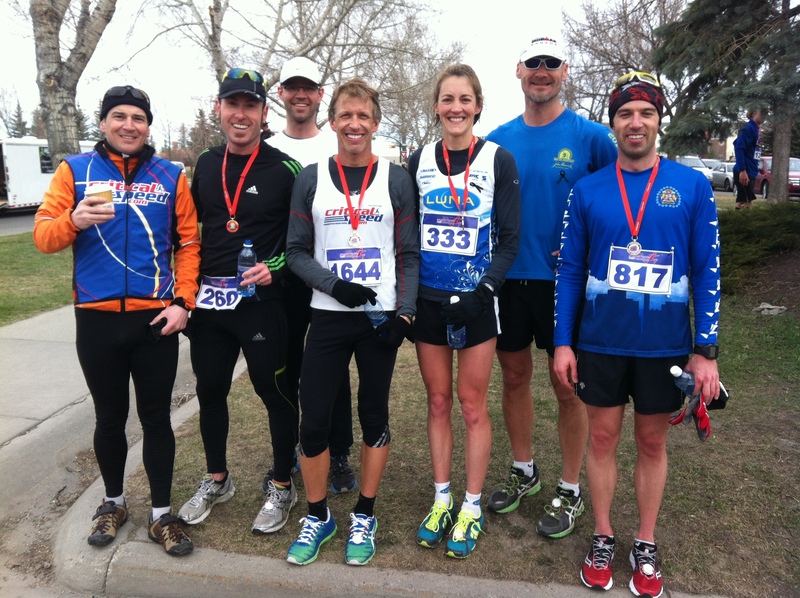 Well, the first race of 2013 is in the bag. It was hot, windy, and dusty but I focused on enjoying life in the in the desert for two days between leaving and returning to mid-April snow storms in Calgary, gheesh! 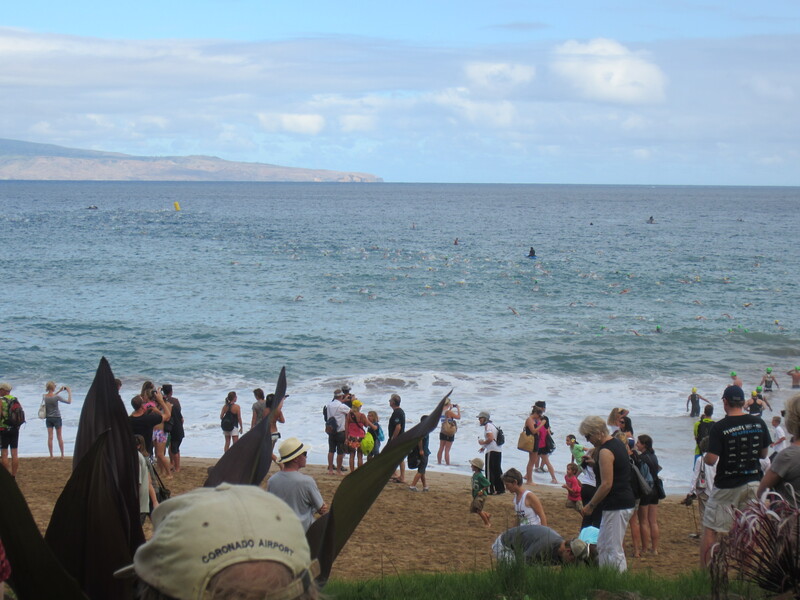 The full-distance Xterra race went off at 10:30 am, a later start than usual. It was already heating up pretty good (the high reached over 90F (28C) by midday). Once my Orca Alpha wetsuit was on, to avoid boiling over I was happy to slip into the cool 57F water for a warm-up, while it was cold to the face at first, once swimming a bit it was perfect. Once the Pro wave was away and swimming I was happy to find myself still with a pack of swimmers and getting some draft by 400m in, woohoo. I stayed with my small pack. After the second buoy in the one lap swim we headed back to the start against a headwind and bit of a chop. I unfortunately lost my pack and was back about 25 seconds by the finish. I kept stroking hard and had a good swim time relative to the competition for me in the end. Once on the bike I was feeling better than I thought I would for getting the winter cobwebs and the first sensations of race pace pain out of the way. I focused on climbing smooth and steady and was having fun on the descents. My Maxxis Ikon tires were perfect for the loose rocky descents, and my Luna team Orbea Alma 29er bike was feeling light on the climbs. I also absolutely love our new Shimano XTR Shadow Plus rear derailleur. (It has a one-way friction clutch that only engages when the derailleur’s cage moves forward, which typically (and frequently) happens when the bike rolls over rough terrain like on this Vegas course. It practically eliminates slap and, because it keeps the chain under tension, it also limits the chance of a chain dropping off the chain rings!) Other than the fact the wind was getting crazy and came close to blowing us off course on the open moonscape. I made up a few spots by the end of the bike as started the run in 5th place. Unfortunately, I also started the run thirsty in the heat, unusual for me and not a great sign! With a good swim, and a pretty decent bike for me on this repeat course, the run is what was the most disappointing. It was definitely a real struggle in the full hot sun. With virtually no flat running, and steep ups and downs, I did not feel like I was moving fast at all, and my coordination was not good for descending. I almost fell flat on my face a few times but saved it! In the end I came within a minute of catching 4th place Mel McQuaid but it wasn’t enough. Lesley Paterson’s fitness is on another planet right now and she finished 4th overall and destroyed the women’s field with a 12 minute lead on 2nd place, my LUNA teammate, Suzie Synder, followed by Shonny Vanlandingham in 3rd. But overall, I am satisfied given the month of crazy travel I’ve had with work and team commitments coming into this race. It was a solid start and I’m looking forward to building fitness and form (with more outdoor training time if spring ever arrives here at home!) with over 6 months of racing still to come, woohoo! 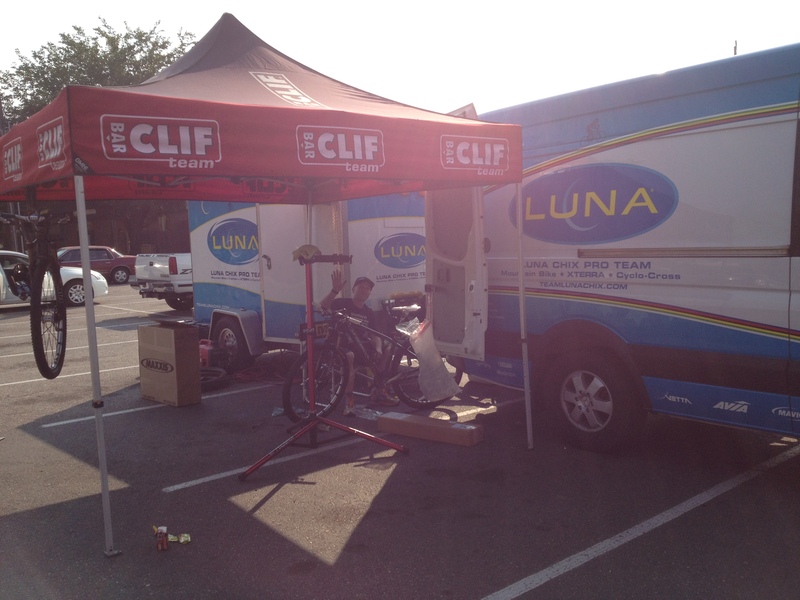 Thanks to our Luna team mechanic, Christ Mathis for supporting the Luna team this weekend!! 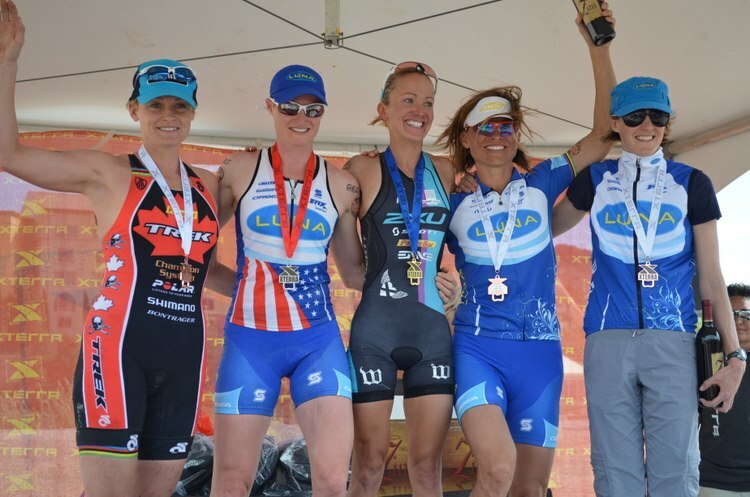 And big congrats to the other moms in the Pro Division, Kelley Cullen (6th place, mom of two, youngest just 10 months old), Emma Garrard (7th place and mom of 4 month old Torin), Brandi Heisterman (11th place, mom of two), Caroline Colonna (12th place, mom of two)!! After a distracting and painful jellyfish sting to one of my fingers in the warm-up swim, I managed to stay focused, calm and determined as we neared go time. The surf was rolling in pretty big on and off but when the Pros started, we lucked out with a few calmer sets and getting in and off wasn’t too bad. I managed to draft for a while and then found myself to the right of everybody but hooked up with a few blue and pink caps as we arrived at the first buoy right on target. I also lined up for the beach well for the first run out in the “M” shaped swim and was happy that I was at least swimming relatively straight through the side wave swells and stronger current further out. Going out to the second buoy became a bit more chaotic and some green caps who had overshot the first run out were swimming straight at us! Finally I was rounding the last buoy and heading for shore. That’s when I got my second jellyfish sting on the chin. As I neared shore and was looking forward to getting on my feet again I got pummeled by a massive wave. My body went into a full on scorpion which my inflexible back did not like at all! Both of my calves massively cramped right up into balls – oweee! When I finally figured out which way was up and down again I clamoured out of the waves and tried to get running as fast as I could to my bike up the long uphill grass climb to transition. As I peeled off my swim skin in transition heaps of sand dropped to the ground, ugh! Even though we had wave starts this year, (two minute gaps between Pros, amateur men, then amateur women), I still had plenty of traffic to contend with for the first 4 miles of the bike. The narrower trail extended longer this year, and although it was relatively wide, the deeper sand on the sides made passing really difficult, I think Xterra has burst the seams by trying to manage 700 peeps on course at once! It was hard to find my rhythm and I was just feeling flat and on the verge of cramping most of the way. Since I wasn’t feeling my usual power on the uphills, I focused on enjoying the downhills and ripping as fast as I was comfortable. On one of the first longer open downhills I was sad to see my Luna teammate Suzie walking with her bike, front wheel tacoed and tube completely off. Attempting to get the climbing legs going! 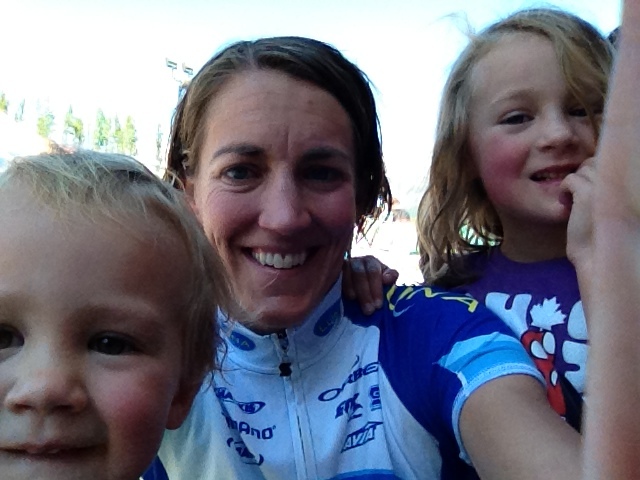 I came off the bike in a tight pack with Brandi, Mel, and Magali. I started the run with Magali and thought all I need to do is stay with her to salvage a decent result. I started with her and but once we hit the steeper grass I was fading. The run felt like a bad dream where I wanted to pick it up but just couldn’t. I tried to respond to every pass that went by me but never lasted long, and finally limped across the line in 12th. A physio friend has since explained to me that my scorpion back compression in the swim likely caused a “neurological injury” to my legs explaining the lack of power and cramping feelings I had – especially by the time I was running uphill on the run – ugh! Three days out it is still super painful to walk around due to sore calves. But enough of my lamenting. Even though we had to evacuate our condo for a few hours the night before due to the tsunami warning, luckily the wave didn’t amount to anything. Race day was a beautiful day, and not too hot. 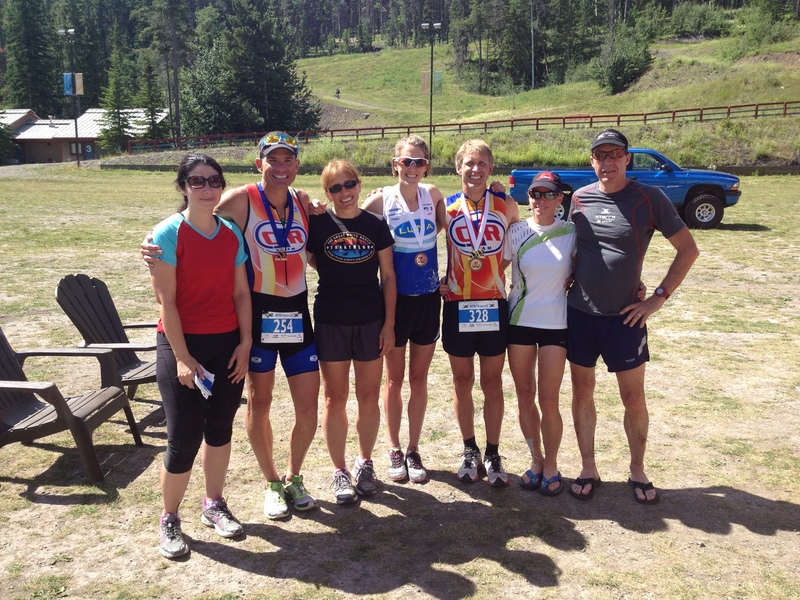 The 70.3’ers and ITU’ers came out and rocked it on the least technical course in Xterra for the men and women. 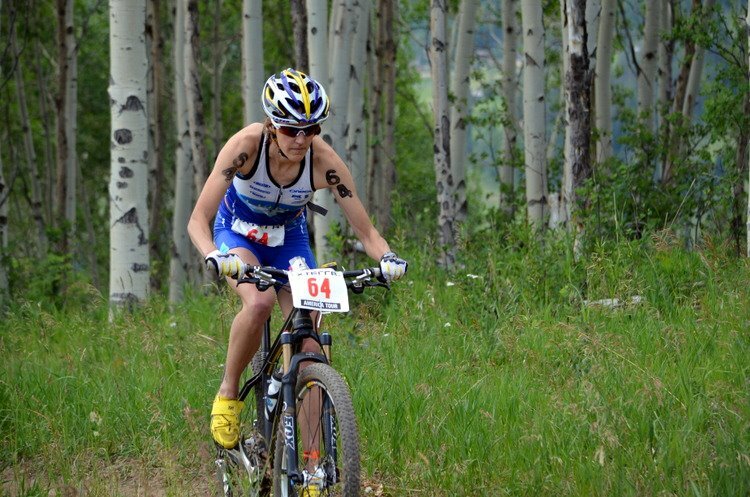 Lesley Paterson crushed the field and handily won her second World Xterra Title. 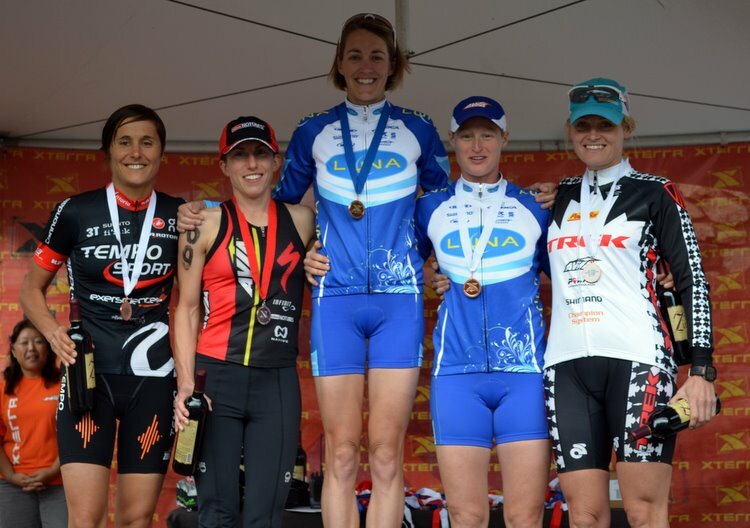 Barbara Riveros of Chile was second, Mari Rabie of South Africa in 3rd, Heather Jackson 4th, and Jacqui Slack, of Great Britain finished up 5th for the last podium spot. Shonny and I happy to be finished! 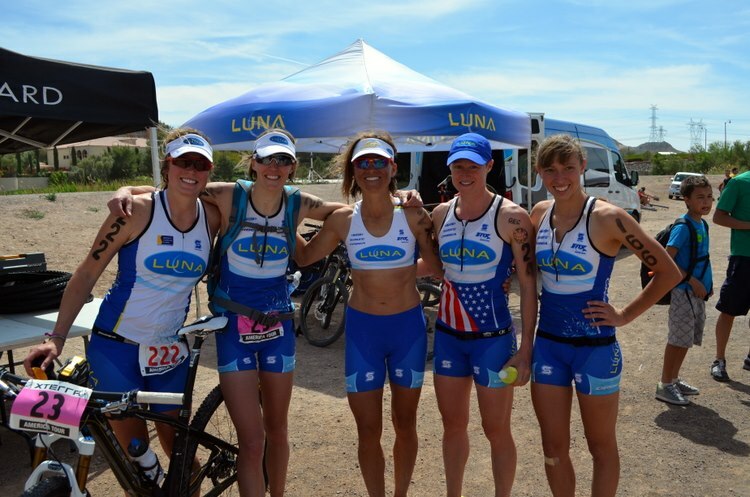 I had an amazing support crew, with Chris and Waldek from team Luna, out to support myself and teammates, Suzie and Shonny. I’m so lucky to be part of such as amazing team! My parents, husband, kids, and brother were also out to enjoy some more summer, to hang out and cheer us on. Even though my last and most important race of the year was a serious disappointment, I’m happy with my overall season, and already looking forward to a luckier 2013! After celebrating my daughter Zoe’s 5th birthday last Wednesday, the following day J-F and I left the kiddies at home with my wonderful parents and flew down to Salt Lake City. We then drove 45 minutes north to Odgen, Utah for a 4-day “race-cation” for the Xterra USA Championship and the final race in the Pro points series. I felt lucky to have escaped catching the nasty cold both my kids had the week before as I would need all the oxygen I could get with this Saturday morning race being at altitude. 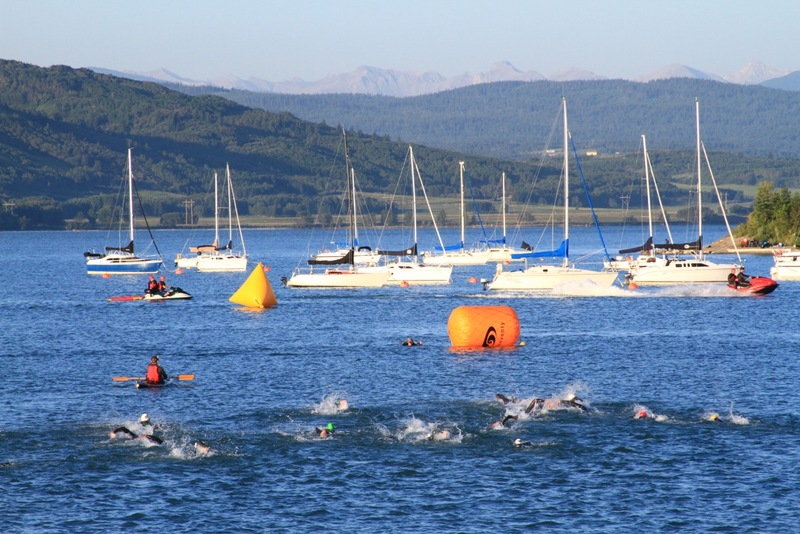 The swim starts at 4900 feet (1494 meters), and the bike course peaks out at 7300 feet (2225 meters) with 3400 feet of total climbing! With a lot on the line, Suzie, Shonny and I were excited to have our Luna team mechanic, Chris Mathis come for the race and get our Orbea Alma 29ers in perfect working order, a definite boost to the pre-race confidence!! This was very true when I picked up a thorn in my tire in the parking area before the race, I might have freaked out just a little but with Chris on hand to seal it asap and reassure me it was fine, I was good to go! Luna team mechanic, Chris Mathis, working hard on our bikes! 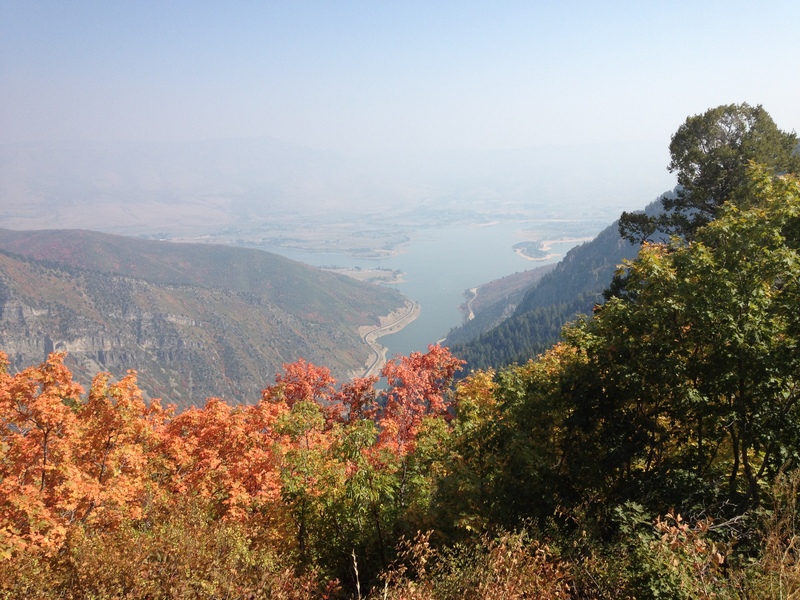 With the Pineview Reservoir lower than ever this year, the swim started a long ways down the usual boat ramp start. It was a wetsuit swim but the perfect temperature. The Pros had a 30 second head start for the 2-lap swim without the usual beach run in between. We headed straight into the morning sun which made sighting the first buoy challenging. I’d had a good warmup but still felt weird and a little weak, the usual beginning of swim panicky feeling, especially as the green capped age groupers starting to engulf me! Just keep swimming, this will pass…and it did. I found myself around Renata the whole swim, and tried to catch on to a few amateurs throughout the swim as they surged by. I was feeling better on the second lap, but dang it was a long swim. Everyone’s times were at least 4 minutes give or take slower than usual, so I finally exited the water after more than 28 minutes! Renata and I left transition together and I kept her in sight on the road stretch leading to the first section of dirt, and up through Wheeler Canyon as we made our way up to the top of Snowbasin. It was rocky double track climbing that narrowed down to single track as we neared the halfway point right before the first of two long sustained descents. The climbing was never too steep, with some rolling downhills and flats to break it up. At the halfway point I was about 3 minutes down from the leaders. Lesley, Melanie, Suzie, Christine, and Jacqui Slack were all still ahead. By the very top of the course, I had passed Jacqui and Christine, with Renata still just ahead of me. After a fun, slalom like long descent and a few more short climbs we entered T2. I went out onto the run in 5th. When J-F told me I was about 2:30+ back of Mel and Suzie, I knew some catching was definitely possible! The run starts with about 5 minutes of straight steep uphill running under the chairlift. It is brutal but it is just about putting one foot in front of the other as fast as possible. Then it is fast, mainly rolling downhill single track with lot’s of baby head rocks to look out for for a few miles. By the halfway point of the run I’d over taken Renata and had Melanie in sight back out on some double track. At about the 4 mile mark I puffed past Melanie and knew I only had a limited amount of climbing to my advantage to close on Suzie before the last mile of more of trail which was all downhill to the finish! With the altitude nothing feels fast on this course but I kept pushing hoping to see Suzie in sight. When I finally did near the end of the descending I put on the gas with gravity to help as best I could. With one small hill before the finish I went as hard as I could but it wasn’t enough and I had to settle for third by a margin of 13 seconds! Ouch. 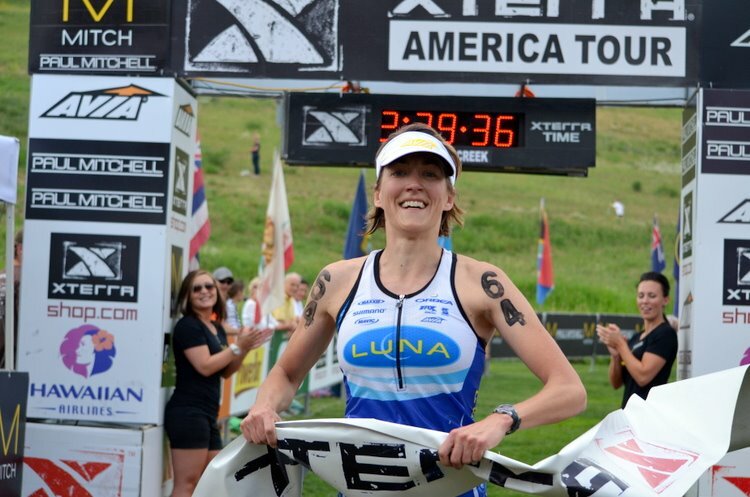 I was definitely gunning for a top two finish but if it had to be third, it might as well be to a Luna teammate, so I’m super happy for Suzie who had the race of her life to date as a Pro! It was an incredibly exciting overall series this year for the overall as well. That 13 seconds would have been the difference of finishing 2nd versus 4th overall in the Pro series as well, so it is a hard pill to swallow and not keep thinking about where I could have found 13 more seconds out there on course over 2 hours and 52 minutes of racing! That said, I am as motivated as ever to get back to work for Worlds in Maui 5 weeks from now. 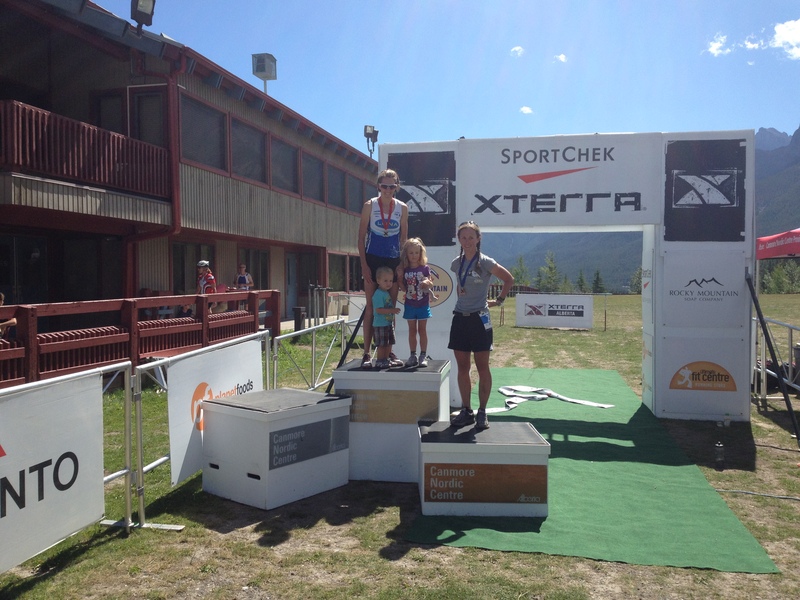 Congrats to Lesley Paterson who took the win on Saturday as well as the overall series title. 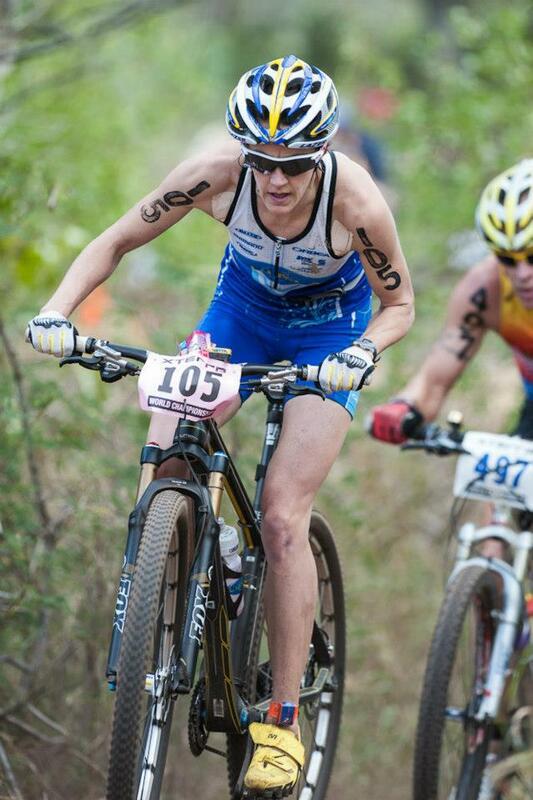 As the reigning Xterra and ITU off-road World Champ, she is THE woman to watch out for on October 28th! 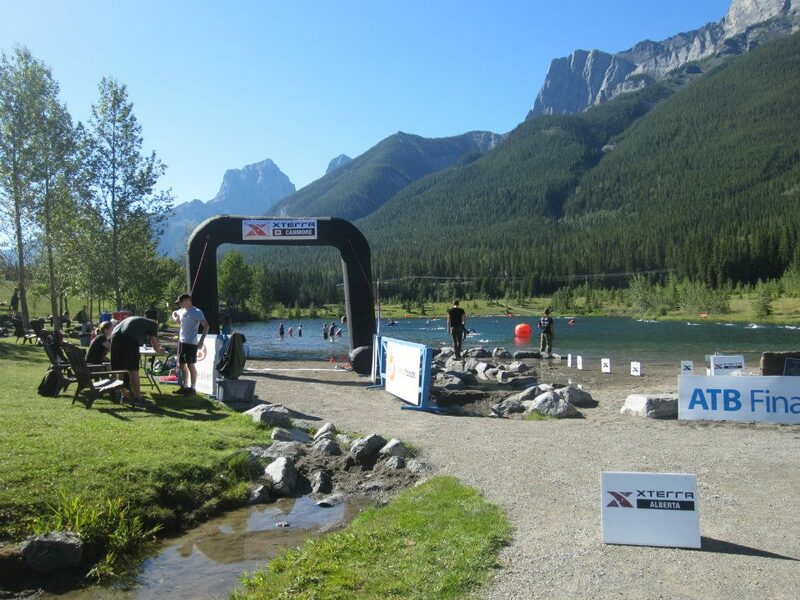 After two years in Whistler, Xterra Canada moved to Canmore this year – a gorgeous rocky mountain town that J-F and I enjoyed living in for five years before moving an hour east to live in Calgary full-time four years ago. It is one of my favourite places to mountain bike in summer and cross-country ski in the winter and did not disappoint as the Xterra Canada venue yesterday! A few blasts of rain the day before and overnight made for some slippery riding conditions, and we woke up to the first snowfall of the season on the mountain tops with the morning temperature feeling not much above freezing. After spending most of my transitions set up time shivering and chilled, ironically I finally started to feel reasonably warm for the first time after I got in Quarry lake for a warm-up swim. 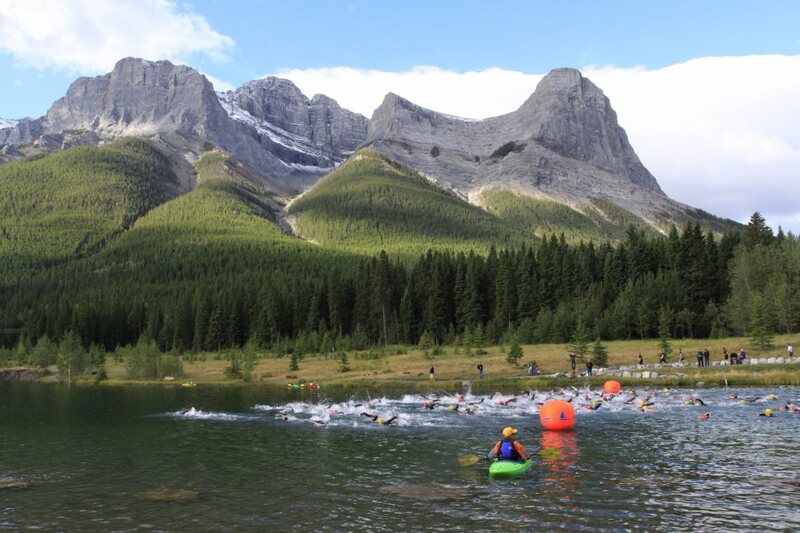 Thanks to a really warm summer, despite some very cold nights recently, the lake stayed reasonably warm for a September triathlon in the Canadian Rockies! The gun went off at 9:30am, and about 150 competitors made the plunge for three 500m laps, and two short beach runs in between. It was a pretty bumpy start in the small lake. My neoprene cap felt like it was choking me, I was fighting to stay calm, sight the buoy, not get kicked or punched in the face, swim hard and find some feet to draft all at the same time – oh, isn’t open water swimming fun! By the second buoy I was in a small pack and drafting. I figured it was an okay pace, as any attempts to pull out and around the two in front of me failed. 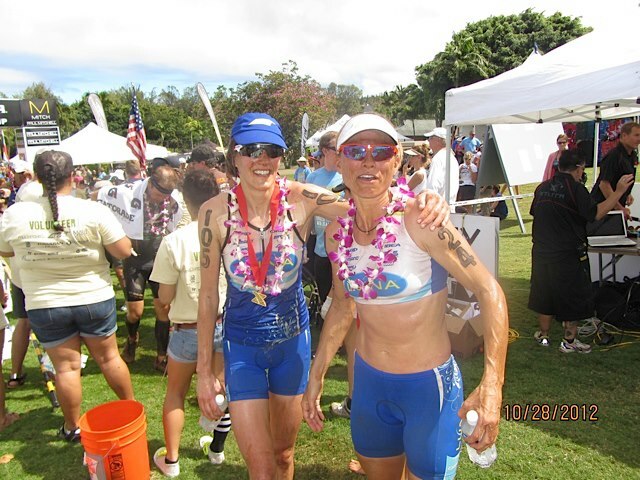 The funny part, I discovered later was that the two I was swimming with were the same two I’d swam with a month earlier at the Xterra Enduro – I guess we naturally found each other again! When I exited the water, even though I hadn’t felt too cold while swimming, my terrible circulation still left my fingers and toes numb. I struggled the entire long run up to transition to get the velcro of my wetsuit undone. Finally, just before reaching my bike I got it undone and could start to get my wetsuit off! Off on my bike, I was over 5 minutes down on swim superstar Christine Jeffrey back in action for the second half of the season, about 2min30 from Melanie and Suzie, and another 1min30 from Chantel Whidney, an ITU triathlete trying an Xterra for the first time. We had about a kilometer climb on the road to get to the Nordic Centre trails, which worked out by giving me the necessary time to get my gloves on my numb hands. I was feeling decent, and other than getting stuck behind a bit of a walking train of peeps off their bikes down the laundry chutes, I had pretty clear trail the first lap. Although the roots were slick I stuck to a good motto a mountain bike race buddy, Mike Garrigan always told me: “ride it like it’s dry!” and didn’t feel like it changed the conditions much at all, perhaps partly thanks to knowing this course and the lines so well. By the bottom of the coal chutes I had moved into 3rd place, but Renata joined me and immediately set a furious pace up heart break hill. I stayed on her wheel for that climb and from then on I kept her in contact and she dangled in and out of my sight for the rest of the ride. 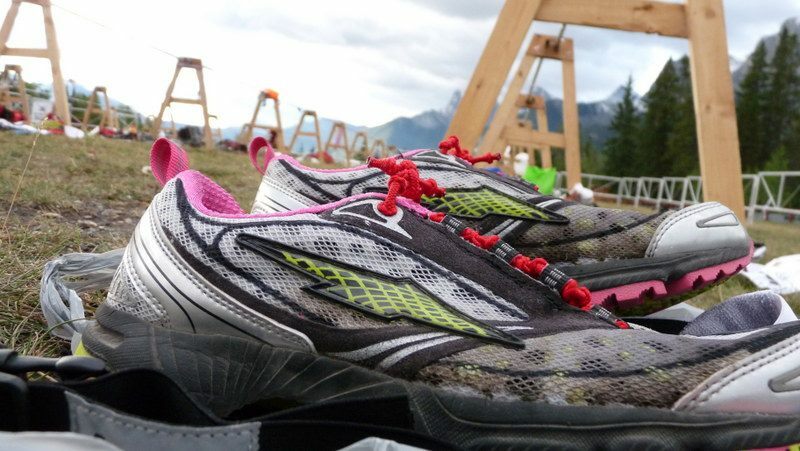 My Avia Bolt’s await me in transition, the perfect lightness and traction for this course! Melanie was out front by over 3 minutes at the start of the run, and Renata had about 45 seconds on me. 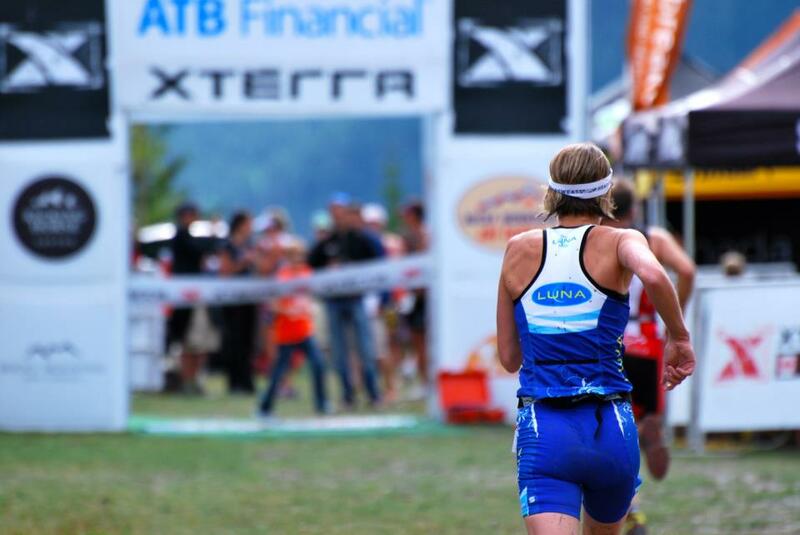 The run was extended by about 2 km from the previous Xterra Alberta course, and it was tough! With rarely a flat smooth section, the run course is constantly up and down, twisting, and over roots and rocks. I knocked my knees together several times and felt like I was about to twist my ankle a few times, especially on the first lap. I didn’t feel smooth or fast and I was hurting and heaving up the killer steeps. But I managed to catch Renata halfway through the first lap. At the halfway point I heard I was still 2 minutes down on Melanie, so I just had to dig and hope for the best. Ian Crosthwaite caught me at some point and was pushing me hard from behind. By the time we hit the Biathlon range, unfortunately Mel was not “catchable” (she finished 1min08 in front of me) but I figured I would try to kick it in and finally drop Ian. When we hit the rocks I tripped and nearly face planted. On the dirt, he dropped the hammer and I tried to respond. That was when I truly hit the wall, its been awhile since I’ve hit the wall that bad running, but I guess if any place in the race, it could have been worse! Overall, I’m happy with second, and a solid race with the second best bike split by seconds to Renata (who finished 3rd), and fastest run split of the day. It was so amazing to have so much support out there and the amount of cheers I heard all day long from spectators, volunteers and even fellow-racers kept me pushing. Congrats to everyone who completed this epic and very tough Xterra course, and to everyone who secured a spot to the Xterra Worlds race in Maui. It will be awesome to have another amazing strong contingent of Canadians there again. 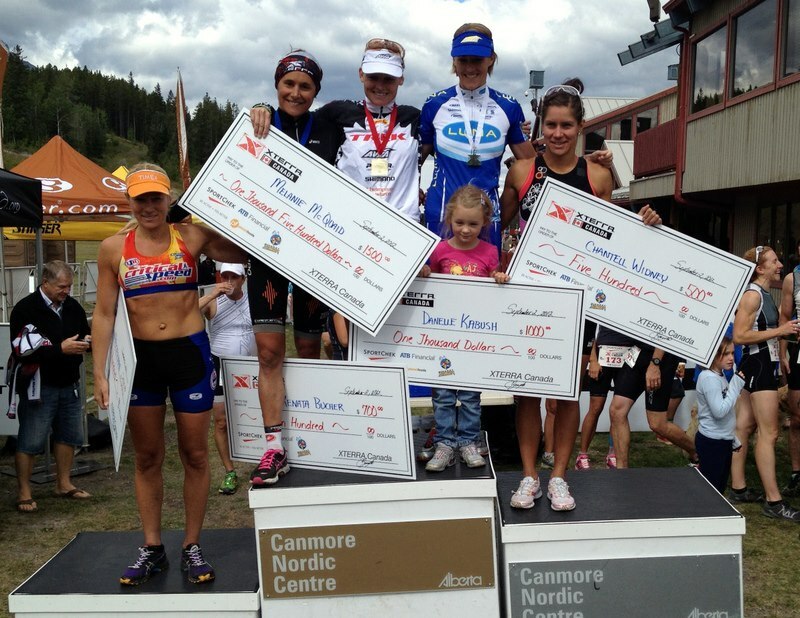 And of course, very cool to have three moms (myself, Brandi and Chantell) on the Pro Podium!! A Dreamy Long Weekend, Enduro Style! They are rare, but a few times per race season I get to enjoy some lower key, casual races, and that is precisely what this beautiful August long weekend was all about. A time to have as much fun as possible with family and friends, while throwing in some “fun” racing. A great chance to get the kind of quality intensity training in that would be impossible to do on my own while also avoiding going too deep into the pain cave that is needed for the more important “A” type races! Event 1: 3000m swim at Quarry Lake (47:50, 10th overall). With a 10:00am start time, it was tough getting my family organized in time to leave Calgary but we arrived with about 20 minutes to spare until the start time. Quarry lake was the perfect temperature to swim with a wetsuit. It is so clear and gorgeous you feel like you could just drink it up while swimming. We did 6 x 500m laps, with a short beach run each lap. I missed a small pack ahead of me, and the first lap probably felt the toughest as I didn’t get time for a warm-up, but settled in and one of the guys I was swimming with said we picked it up each lap so that was cool! 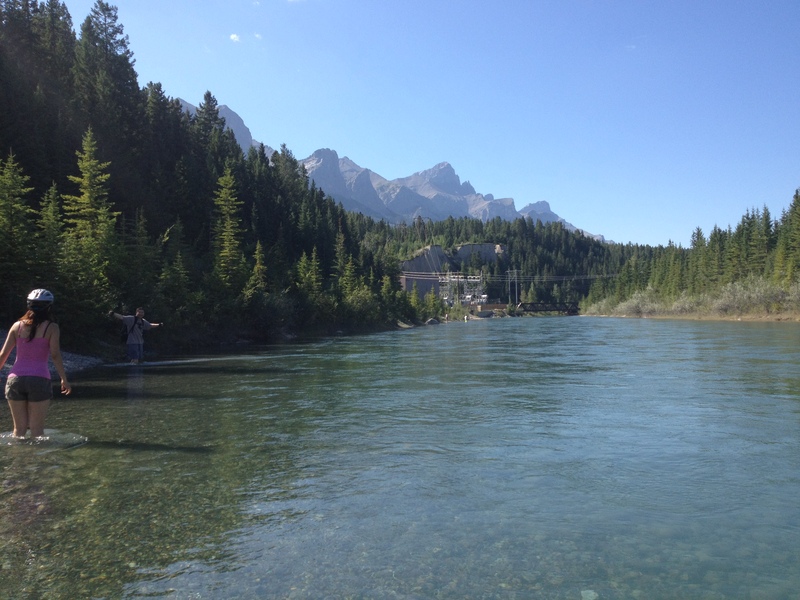 Check out the incredible conditions that made for a very enjoyable swim! 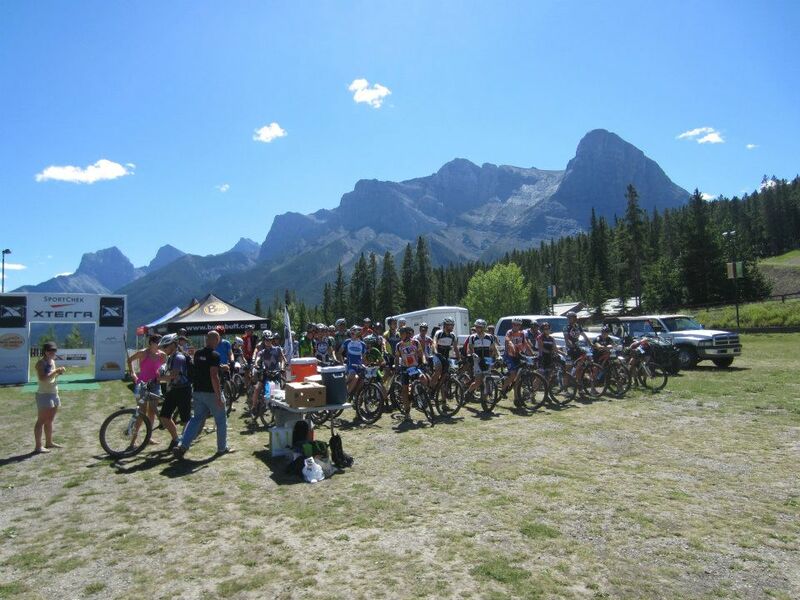 Event 2: 40km mountain bike at the Canmore Nordic Centre (2:43:46, 4th overall). 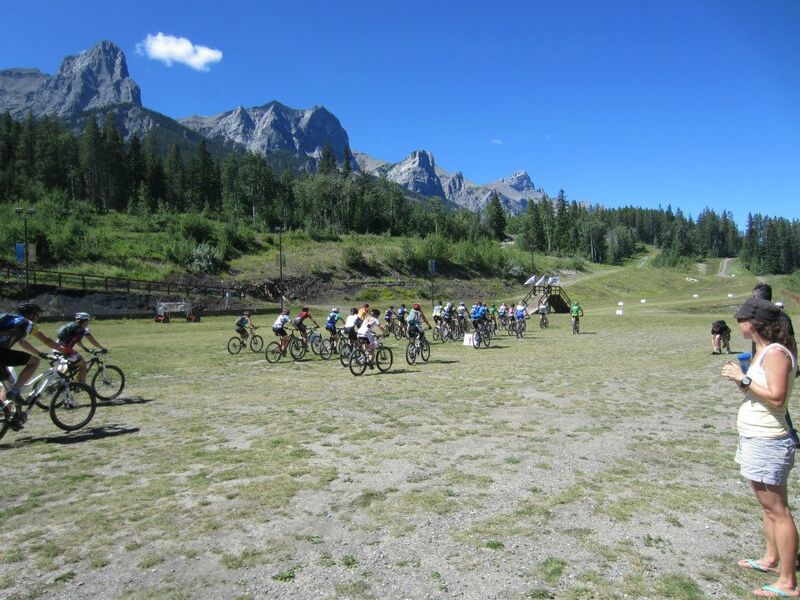 After some time for a lakeside picnic it was time to head up to the Nordic Centre for a 2pm start for the 40km mountain bike race and it was hot!! I went through 3 bottles and three gels and was definitely feeling thirsty most of the race, but actually felt a bit stronger and more technically on by the 3rd and 4th final lap. On pretty much the identical course to last year I was 6 minutes faster so that was encouraging. 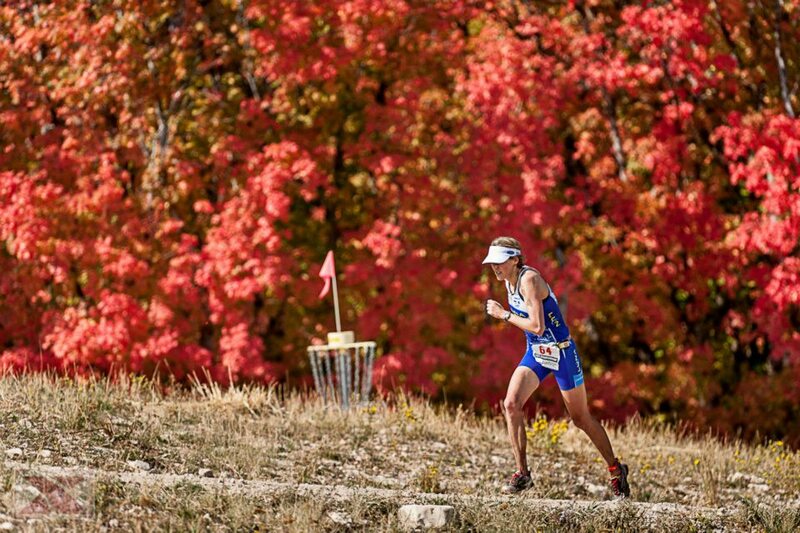 This demanding course involves pretty much all the climbing at the Nordic Centre but of course it is mixed with fun descents like laundry chutes, the Albertan and the coal chutes. Heading off and up and up and up to start! 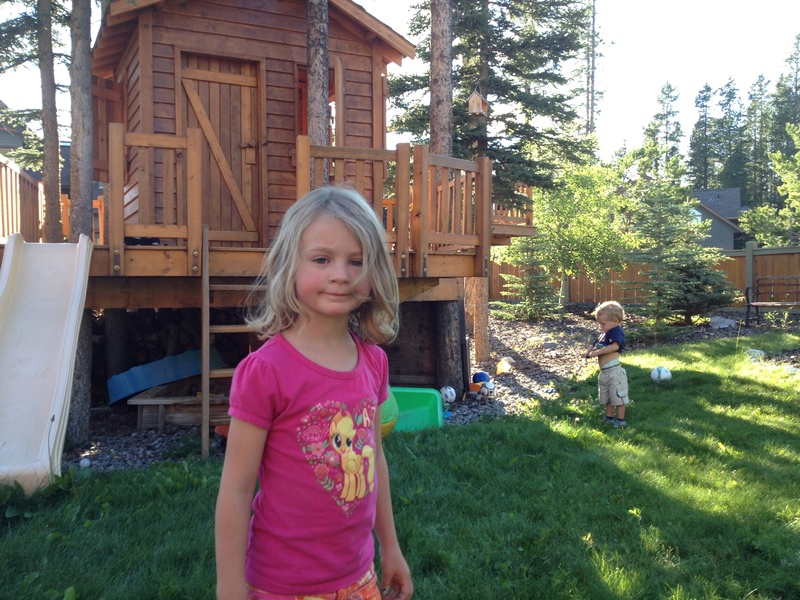 After the bike race, it was off to Kyle, Carrie, Fin and Will’s house for an awesome BBQ. 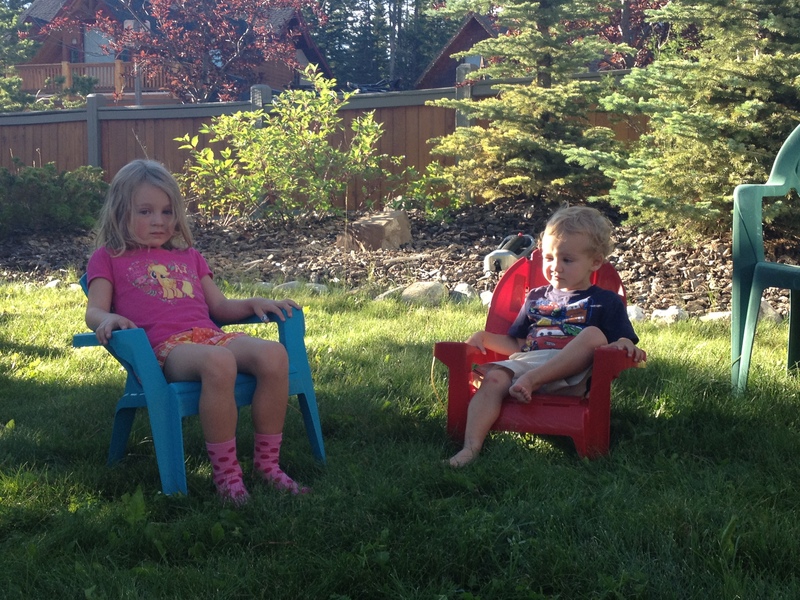 Zoe and Nico had a blast chilling in the backyard and you can see why! 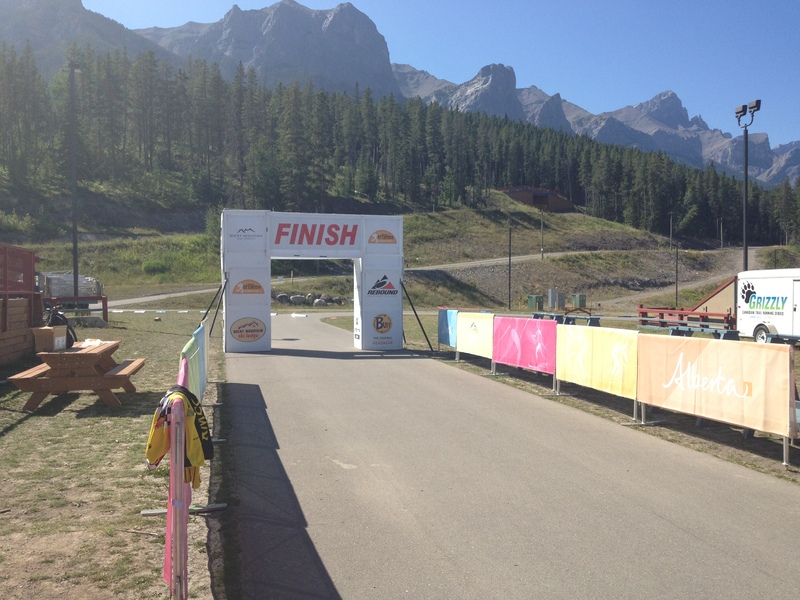 Event 3: 20km trail run at the Canmore Nordic Centre (1:50:30, 5th overall? still waiting for run results). Sunday morning, it was back to the Nordic centre with beat up arms and legs to line up and run 20km on the trails on the same course we rode the day before meaning major climbing and lots of rooty descending. After a wee bit of “yogging” around the stadium to warm up we were off. Like a delayed brick, the legs were feeling pretty heavy the first bit. I actually started to feel better on the second lap and got my downhill root running coordination working a little better! After one lap, the second woman was about 10 seconds behind me, so I decided to pick up the pace up the climbing to the laundry chutes. I didn’t see her again but had some good back and forth running with some of the guys out there. And I managed to take a good seven minutes off my time from last year, so another good sign of hopefully improved fitness, or maybe just a willingess to go a little harder in this challenging race, ha! Stay calm and carry on. That was my motto of the day while racing my 4th Calgary 70.3 yesterday. Although my day started off with a weird series of unlucky events, I managed to enjoy myself by the end and it was a great way to cap off a long stretch of racing at only the mid-point of my season! Here is the story…. To start the day off I arrived at transition to find a new tube stuffed in my bottle cage (at this race, we need to rack our bikes the day before). I realized why when I noticed my front tire was completely flat! Luckily with the great help of Speed Theory, the mechanics on hand quickly changed it for me while I got my gels taped on, body marked, and into my wetsuit. I had about five minutes to “warm-up” in the chilly water at Ghost Lake, before clamouring out onto the dock, where the Pros were diving off for the start. I was sure I had my goggles on good and tight, but as soon as we dove in after the gun went off, my goggles were full of water – doh! After stopping quickly to empty them, I got back with the tail end of the group and was happy to settle in with three other women for the rest of the swim. With my neoprene cap on, the water temp was bearable but I was still grateful for the wetsuit strippers as my hands and feet were pretty numb after over 30 minutes in the water. 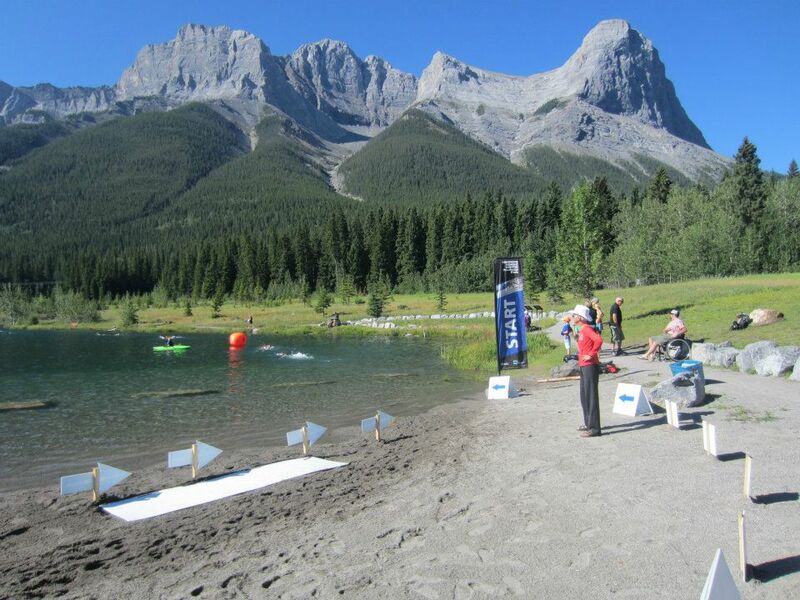 A pic of the swim start at Ghost Lake showing was a gorgeous day it was! Most of all, I was rather excited to be heading out of the water and onto the bike in a group so I’d have some competition to key off of on the ride. (The small Pro Wave starts 15 minutes ahead of the next wave, which can make it a pretty lonely day of racing, I definitely prefer the mass starts for a half-ironman.) Unfortunately as I went to mount my bike, I noticed my bars were completely bent downwards and off to the right. (Later on I noticed my left brake lever was bent inwards as well!). After what felt like an eternity of loosening and re-tightening the handle bar and stem bolts (turns out it was approximately 3:30 that I lost when calculating the difference between my 5:11 transition time and most of the other Pro T1 transition times) I lept on my bike to find my chain was completely off. Finally, with black greasy hands I was off and riding angry and solo! I was totally bewildered at what had just happened to my bike as I had purposely checked and tightened those exact bolts the day before the race! Either way, it took a serious beating from someone as it was even hard to loosen them to fix it, but on with the race! While it was frustrating to start out for a 94km ride and 21.1km run likely out of contention for a good finish result, I was also happy to get going and just decided to focus on giving it my best from there on and make it a good training day at the very least! After all, it was a perfect 25 degree summer day so I couldn’t complain. 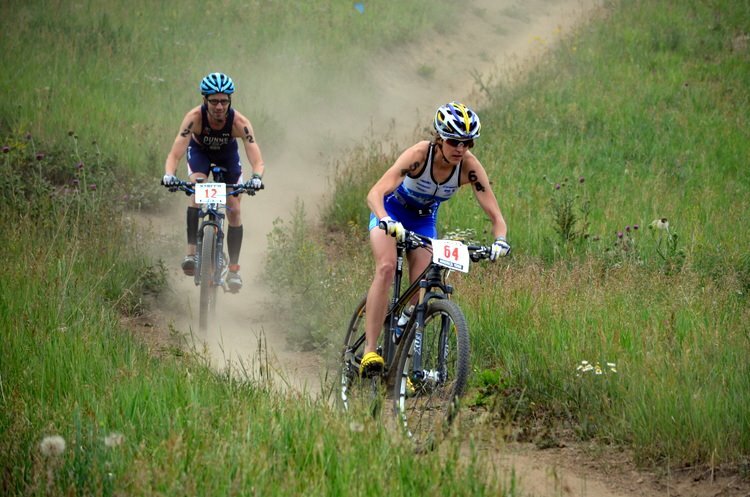 One guy passed me from the next wave at about 40km, and I passed one Pro guy, and caught up to one other Pro woman by the end my 2h29min on the 94km bike ride – pretty exciting – there are many reasons I prefer Xterra racing, ha! Off and running, I felt pretty good right away. I had downed my two bottles, 4 gels, and 3 electrolyte tablets on the bike. Making good use of the coke, water, and cold sponges at every aid station, it didn’t feel too hot at all on the out and back bike path run. At least 2/3 of it was in the shade too which was nice. 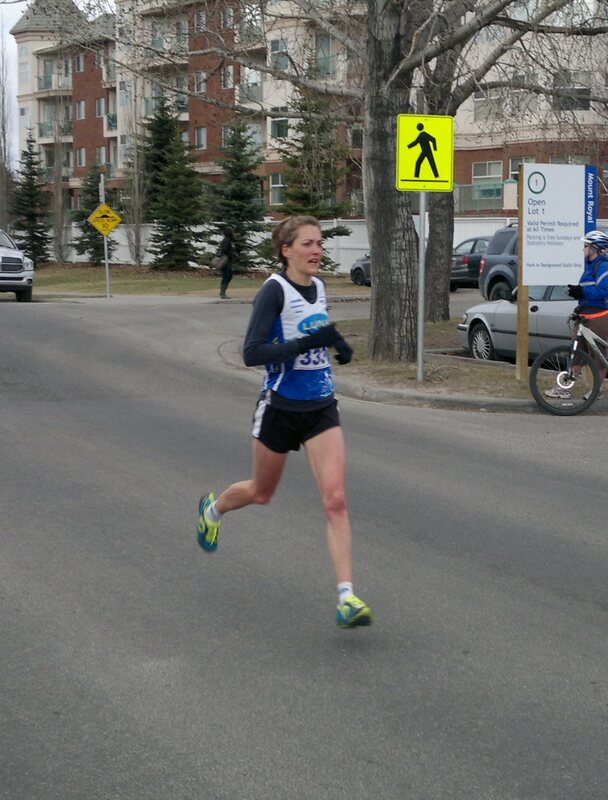 By about the 15-16km mark I finally did some passing and moved into 8th place by the finish with a 1:26:57 run split, the 5th fastest women’s run split of the day and my best run time on this race course for my 3rd attempt. To note: the fastest women’s run split of the day was by a fellow Critical Speed athlete, amateur champ of day, and new amateur course record setter, Sheila Croft – she ran a 1:24:30! With one of the strongest fields yet, the amazing Magali Tisseyre (CAN) took the win, followed by Heather Jackson (USA), Melanie McQuaid (CAN), Sara Gross (CAN), and Lisa Mensink (CAN) for the top 5 on the podium. Well, after a good little fitness test on the road, I will retire my TT bike, and not very existent TT riding muscles for the rest of 2012 and look forward to more riding on the dirt now. 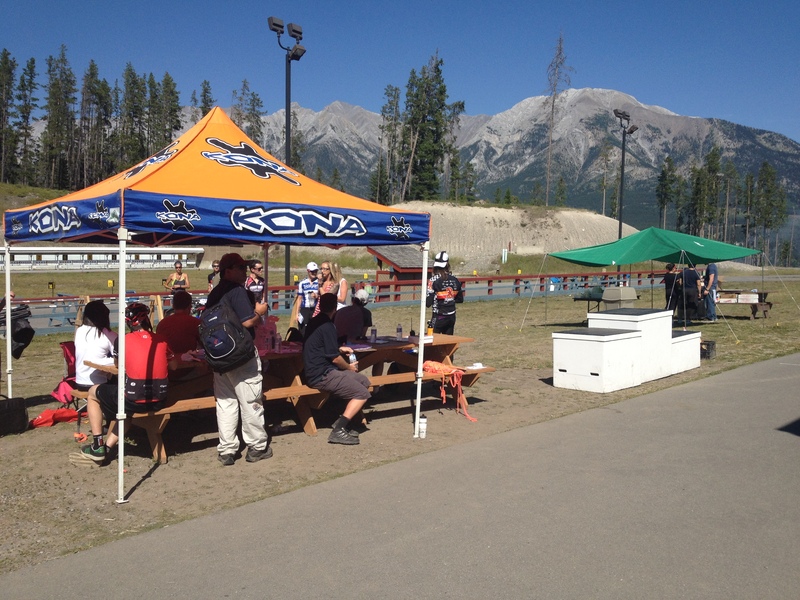 Next up is the very fun Xterra Enduro race in Canmore next weekend (Aug 4-5). 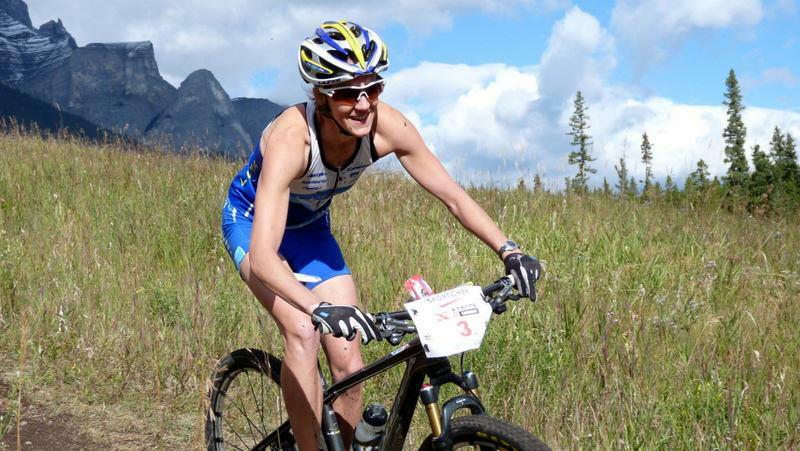 Come on out for a fun two days of three individually entered events or go for an overall time with a 3k swim, 40km mountain bike, and 21 km trail run! UnBEETable! 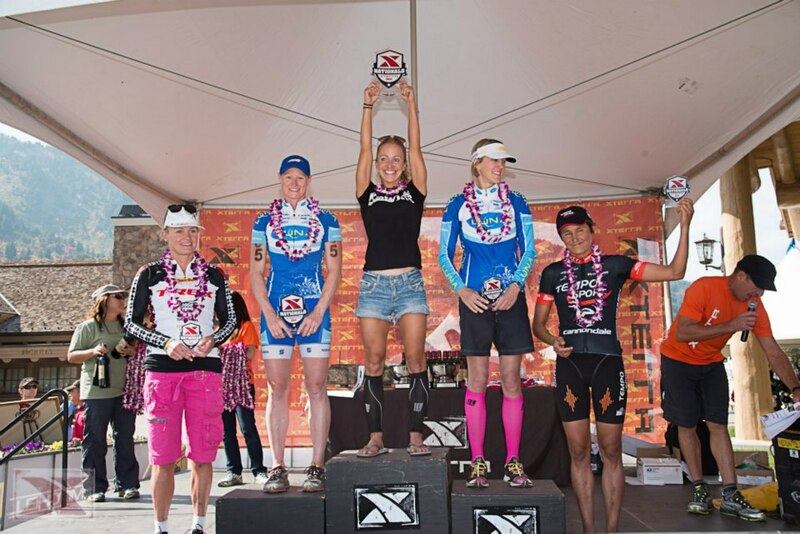 That was the joking chant I shared with the Rakita family and Craig Evans after crossing the finish line for my first Xterra series win at the Xterra Mountain Championships in Beaver Creek, Colorado. I had scarfed down as many beets as I could handle the night before the race, with the laugh that the extra nitrates would help the oxygen uptake while racing at altitude. Placebo or not, my race went as well as it could have after spending the previous two weeks at sea level! The swim was conveniently located in a small lake just a stone’s throw away from our condo, so after waking up and driving our run gear up to T2, it was a pretty relaxing morning getting ready for the 9:00am start time. It was a wetsuit swim with the water temp about 66 degrees Fahrenheit – just right! With four wave starts at two minute intervals, the Pros went off first. I was in a group, actually drafting and feeling okay until we rounded the first buoy. While breathing towards the buoy side I accidentally inhaled a bunch of water instead of air. Gulping and choking (it is hard enough to breathe at altitude) I momentarily panicked and did a bit of breast stroke until I could breathe properly again. Unfortunately after that I was all on my own and just had to find my own rhythm and swim as straight as possible between the buoys. On the gravel road descent that lead into the first single track descending Mel flatted, not the satisfying pass I was looking forward to but I said, ‘I’ll take it!” The top of the course began with super fun descending down fast switch backs. Then was a fun mix of shorter climbs, single track descents, and flat fast big ring sections to traverse to the other side of the mountain climbing before a final longer descent into T2. Sara and I went back and forth at least four times. We were moving fast, and it was a good battle. In the last descent I got a bit of a gap and went out on to the run with about a 30 second lead. Wow, it was the first time I didn’t have anyone to run down! I didn’t let up, and felt pretty darn slow going up all the steep climbing in the run but despite the suffering, and with no one in sight behind I managed to begin to enjoy the scenic run before letting gravity take my legs as fast as possible down the final long hill to the finish line. It was a fun day under perfect race weather conditions! A win definitely helps make me feel much better about the few extra days of gorgeous weather and family vacation time I had to miss on Hornby Island for this race! Thanks to everyone for the kind words and support! Now I’m looking forward to not getting on a plane for a while and enjoying several races around home through the end of the summer. 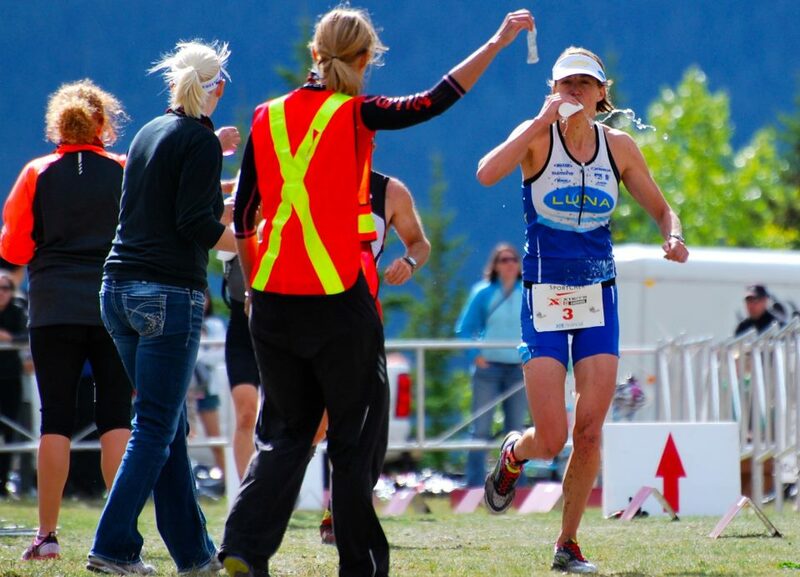 Next up is the Calgary 70.3 on July 29th.